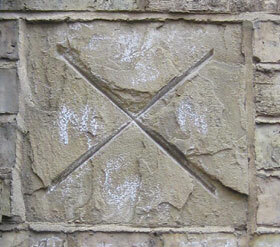 The original parish boundary of the University Church of St Mary the Virgin remained unchanged until 2009, when it took in the parish of St Cross with St Peter-in-the East, making the parish about three times as big as it was before. 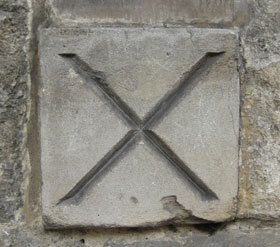 Their boundary stones are inscribed with a St Andrew’s cross. With St Peter-in-the-East parish, whose church is now deconsecrated and used as St Edmund Hall Library. 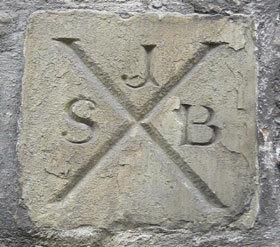 The parish of St Peter-in-the-East was first incorporated into that of St Cross, but that church too has now been deconsecrated, and its enlarged parish has been taken into that of St Mary-the Virgin, making some of the boundary stones quite redundant. 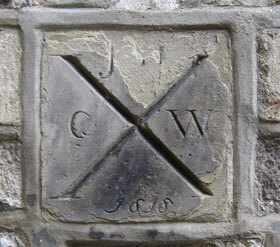 The Church of St Mary the Virgin has other boundary markers inside University, Brasenose, All Souls, Hertford, and Oriel Colleges: these are not on the public highway and so are not shown here. 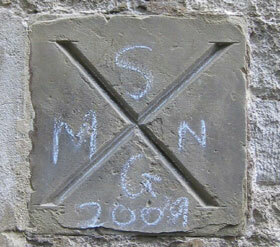 As can be seen from the chalked “SMNG” on two of the above stones, the Church of St Michael-at-the-Northgate also marks some of the boundary stones put up by St Mary’s, as the two parishes are contiguous. Following Ascension Day Communion at 8.30am, the Vicar sets out from St Mary-the-Virgin Church with the congregation and some boys from New College School. The procession first stops at the cross on the outside wall of Brasenose College on the High: that happens to be a St Michael’s cross, but all the rest are the diagonal ones of St Mary-the-Virgin, starting with two inside Brasenose College. The procession then moves up to the marker at the south-west corner of the Bodleian Library, and on to Broad Street to the one on a pillar of the Clarendon Building. 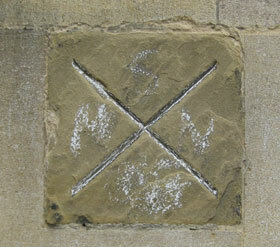 It then goes back down Catte Street to All Souls College, and beats the markers inside. It then goes on to beat the two markers in University College, and the boys are rewarded with sweets thrown from an upstairs window (it used to be burning-hot coins). 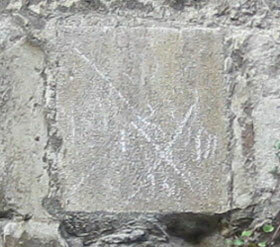 One marker gets beaten in Magpie Lane, and two inside Oriel College; and the job is then done.